Bebop was a Human punk, who along with Rocksteady became Shredder’s right hand men following his mutation into a Mutant warthog. Bebop was originally an African-American human gangster that was employed by Shredder, affiliated with the likes of thugs such as fellow mutant Rocksteady. 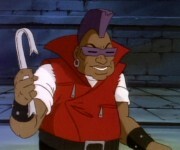 Bebop was a tall African American man with a purple mohawk. With the other members of his gang, he was sent out to stop a Channel 6 reporter named April O’Neil from doing a report about crime in the city. April ran down into the sewers while being chased by the street gang and met the Teenage Mutant Ninja Turtles, who then defeated the gang in a fight. After his army of Foot Soldiers failed to stop the Turtles, Krang suggested that Shredder mutate his own mutant soldiers so that they would have abilities parallel to the Turtles’ to fight his enemies. With a new plan, Shredder sought two “volunteers” for his experiments. Bebop and Rocksteady both volunteered to undergo the procedure (though neither was particularly aware of what it would entail) with the promise that it would allow them to exact revenge on the Turtles. Using robot drones, Shredder stole a rhino and a warthog from the zoo and brought them in the room with his new test subjects. The result…Bebop became a mutated mix of warthog and man, donning twin turtle shells on his shoulders to mark his new job as an enforcer for the Shredder. However though the transformation did make them larger and stronger, the Shredder’s choice in test subjects were…less than stellar. Although tough, both Bebop and Rocksteady were far from the brightest of the bunch. For example, in Enter the Shredder they charged at the Turtles, who jumped, and crashed into each other. Donatello commented that their mutations didn’t “up their IQ’s any.” For most of the series they were employed for purposes however, the Turtles certainly consider them to be formidable (despite their stupidity) in combat due to their great strength and endurance, and as such, often use their intelligence to outwit them rather than fighting them in a straightforward manner. Despite his supposed lack of intelligence Bebop is continuously employed by the Shredder and is entrusted to carry out various jobs that almost always fail miserably. In one episode of the series, Bebop was shown to have kept a pet turtle, which got mutated into the evil turtle Slash. However, on the “Red Sky” season they seem to grasp some form of intelligence, but talked and joked around less. Bebop and Rocksteady’s last appearance is in the season 8 finale Turtle Trek. In that episode, the Turtles destroy the Technodrome’s engines, trapping it and its inhabitants in Dimension X for good. Bebop and Rocksteady are never seen again after that episode, but Krang and Shredder return during the 10th and last season. Bebop and Rocksteady are presumed to still be somewhere in Dimension X. He was voiced by Barry Gordon most of the time. Bebop was featured in the following TMNT Adventures series, with a similar origin and dimwittedness. Like the cartoon, he and Rocksteady were punks mutated by the Shredder to help him defeat the turtles. As the series progressed, the animal side of Bebop and Rocksteady surfaced as they dreamed and longed for the ‘old days’ when they were just animals in the wild. When the Shredder and his bunch were defeated by the TMNT in the ‘Final Conflict’ (issue #13), Bebop and Rocksteady were banished to an Eden-World, a huge paradise planet in Dimension X full of wilderness and natural wildlife, without any humans or similar to disrupt their peace, and they enjoyed it. They became less interested in evil as their intelligence increased. In issues #23-#25, Krang, who was banished to the toxic waste dump planet Morbus for exiled criminals, befriended two other criminals, Slash and Bellybomb. The group stole a spaceship and headed to Earth but stopped at the same Eden World Bebop and Rocksteady happened to be on. Being bored of Paradise, Bebop and Rocksteady join them on the trip back to Earth. However, rather than battle the turtles, the pair left Krang and the villains to fight the turtles and wandered the streets of New York City on their own. They robbed a clothing store to get clothes similar to their original attire. They then rob a gun store for some guns. Then they went to the zoo and blasted all the cages, setting all the animals free. Just as the turtles managed to defeat Krang (who had taken over Shredder’s body), Bebop and Rocksteady arrived with guns and all the zoo animals, intending to take them back to the same Eden world. The turtles surrendered and let Bebop and Rocksteady escape in the spaceship with the animals. Leonardo asked them to take the defeated Krang and Bellybomb with them back to Morbus in Dimension X (Slash had already left the scene and was wandering the city). Bebop and Rocksteady did as asked and bid the Ninja Turtles farewell. The final panel of #25 shows the two mutants removing their clothes and going back to their simple life in the wilds of the Eden World. Bebop maintained the same abilities he demonstrated in the cartoon, including his superhuman strength. Bebop and Rocksteady made a reappearance in the made-for-tv movie ‘Turtles Forever’. In the flashback describing how the Turtles crossed dimensions, they said to their Turtle counterparts that they were facing off against Shredder and the Technodrome, meaning that he got the machine out of Dimension X (as well as Bebop and Rocksteady). He Rocksteady end up working for Ch’rell after he takes over the Technodrome. Their incompetence is still shown, although it ended up saving the Utrom Shredder when Rocksteady accidentally tripped over and unplugged a laser that was about to destroy him, although Bebop ended up obliterating the Utrom Shredder anyway when he replugged the same laser device all the while thinking he would be pleased that they “fixed” his machine. All this happened just as the Utrom Shredder was unleashing a plan that would wipe out Ninja Turtles of all planes of existence (even if it meant destroying himself since he was still linked to them), so ironically… Bebop saved all of Turtle existence. In the film Bebop was voiced by Braford Cameron. Bebop: The original figure release, it was released alongside the four Turtles, April, Splinter, Rocksteady, Shredder, and a Foot Soldier. Slight differences from his animated counterpart included differently shaped sunglasses (which were also blue instead of purple) and his leg brace being the same color as his pants. Accessories included a power drill, a double-bladed knife, and a garbage can lid to use as a shield. Head Spinnin’ Bebop: Slightly different color-wise from his previous figure, including blue shoes and a golden skull necklace. His head is completely different, as the sunglasses are an accessory rather than sculpted onto his face. Bebop’s tongue is hanging out of his wide-open mouth, and he includes an action feature which makes his head spin. Accessories include sunglasses, ball and chain, belt, and a sickle. Giant Bebop: A jumbo-sized version of his initial figure release. Came with a drill. Mutatin’ Bebop: Transforms from human to mutant warthog. For whatever reason, his human form was depicted as a Caucasian male with an orange mohawk (thus causing his hair to change color during mutation). While he retained his usual vest as attire, Bebop wore a very faint pastel purple sweatshirt underneath. The color of his skull necklace was also changed to green. Prototype photos of the figure showed him as wearing a red coat instead of a vest, with a white undershirt. Accessories included a camera that transformed into a drill, a Retromutagen Ooze canister, and fold-under drill and sai weapons for his shoes. Ninja Knockin’ Bebop: Outfitted with a purple vest, pants, and mask, as well as white arm wraps, this Bebop figure most closely resembled the popular Rock ’em Sock ’em Robots toys, albeit without the boxing ring arena. An accessory plugged into his back would cause his limbs to flail in an attack-like motion, and any strong hit (likely from another “Smash ‘Em Bash ‘Em” figure) would cause his neck to extend. Private Porknose Bebop: Decked out in a purple military officer’s uniform and with an Army helmet, this Bebop figure came with a pistol, a rifle, and two grenades. Mighty Bebop: Not to be confused with the animated character of the same name, this figure more closely resembles Bebop’s “Mighty Hog” superhero identity. Outfitted in red spandex and a red eyemask (ala the Turtles’ masks) and with a purple cape and a black/white yin-yang-like “B” logo on his chest. Came with a shield, a wrist-mounted dart gun, and “Harey, the Beefed-Up Bunny”. Night Ninja Bebop: Wears sandals and a blue kimono and has a blonde mohawk. Chest and shoulder armor, as well as a black balaclava appear from his back upon squeezing his legs. Accessories included tonfa, a pair of wrist chains that transformed into one large one, blades that fold under the sandals, and a can of Ooze. Cave Beast Bebop: Wearing a blue singlet and gray boots, with a bone stuck through his nose, he also included a “Bodacious Brontosaurus” figure. Accessories included a stone sword, turtle skull staff, and a saddle-and-reins for the Brontosaurus. The Crushin’ Slam Bam Combo Mini-Mutant Technodrome with Samurai Cycle and Mini-Mutant Bebop Figure! 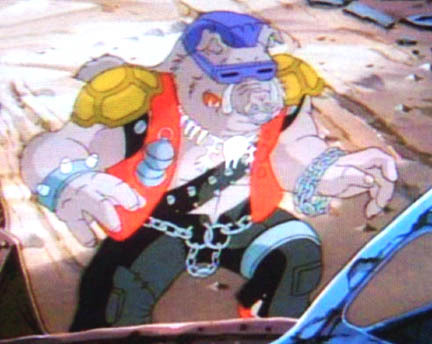 Bebop appeared as a boss in many of the Teenage Mutant Ninja Turtle video games, sometimes paired with Rocksteady as a double-boss. Even though Rocksteady was a boss in The Hyperstone Heist, Bebop was nowhere to be seen. In the first home-release game, Bebop is a mini-boss fought in the sewer. Rocksteady guards the captive April on a ledge above, while the player battles Bebop. The TMNT arcade game sees Bebop as the second boss, utilizing a ray gun, as well as charges and punches as attacks. In the arcade version, he returns with Rocksteady in the fourth stage. Teenage Mutant Ninja Turtles III: The Manhattan Project has Bebop as the third boss. This incarnation is slightly similar to his Head-Spinnin’ Bebop action figure, complete with a ball and chain attached to his head. Bebop is a boss exclusive to the Super NES version of Teenage Mutant Ninja Turtles: Turtles in Time. He appears at the end of the game’s sixth level, Skull & Crossbones, with Rocksteady. Both of them are decked out in stereotypical pirate regalia, and Bebop is brandishing a whip. Bebop appears as a boss in Teenage Mutant Ninja Turtles: The Manhattan Missions. Bebop is the second boss of Teenage Mutant Ninja Turtles: Fall of the Foot Clan. His attacks are much the same as in the arcade game. In Teenage Mutant Ninja Turtles II: Back from the Sewers, Bebop is again the second boss. His tactics include running, jumping, and firing a traditional gun. Bebop can be seen in the background of War’s stage in the SNES version of Teenage Mutant Ninja Turtles: Tournament Fighters. The Russian PC version TMNT: Mutant Melee had stock art of Bebop on the cover. Bebop is not only not in the game, but is also not even in the universe in which the game takes place. Bebop appears in Tales of the TMNT Volume 2 Issue #58. Bebop was the creation of David Wise, based on instructions by Fred Wolf to “put more mutants in the series”. According to Enter the Shredder, Bebop apparently is an avid reader of comic books. Bebop and his cohort Rocksteady were slightly more of a threat in the Archie Adventures adaptation of the TV series origin. This could be attributed to issues of violence on TV, still, although he could be considered being slightly more competent in the comics it wasn’t by much. Even so, by the time Archie Adventures started doing their own theme, it seems Bebop and Rocksteady reverted to something more similar to their cartoon counterparts. Despite being black in the cartoon the Mutatin’ Bebop action figure shows Bebop’s human form as a white man. In the 2003 series episode Samurai Tourist, Gen, an anthropomorphic rhinocerous, is being chased by Kojima, an assassin who happens to be a humanoid warthog, like Bebop. In another episode, Future Shellshock, Michelangelo falls out of a truck and onto another vehicle, the driver of which looks exactly like Bebop, only with smaller, more modern sunglasses. In TMNT, He and Rocksteady were mentioned in Shell Shock, a rap song that played in the end credits. Bebop appeared in 4Kids’ 25th anniversary special, Turtles Forever. Pastiches of Bebop and Rocksteady can be seen in issue #29 of Sonic Universe, in prison with the evil version of Sonic, Scourge.